Cyprus watersports activities let you have fun both IN and ON the water. There are lots of companies across the island offering a full range of watersports including waterskiing, wake boarding, sailing, diving, para gliding, jetskiing plus all the silly stuff like banana boat rides or being pulled along behind a boat in a rubber ring or sitting on top of a "doughnut." 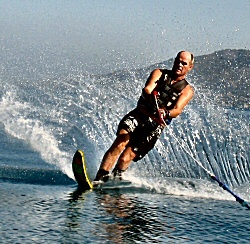 I've learned to waterski in the last few years as we have friends with a boat who have been skiing for over 20 years. It's not easy, but with perseverance, you can get up on two skis and, once you've managed to get out of the water without falling flat on your face, you can then practice crossing the wake, weaving from side to side behind the boat. Tip: Make sure your skis are the right length and fit. I tried to learn first on skis suited to someone of 5ft 6" or more. With my small feet and height, it was REALLY hard! Once I borrowed some kids' skis that fitted my feet perfectly, it was a breeze. With Cyprus blessed with sunshine for much of the year, it's a perfect location to learn to water ski as the sea water is really warm for 8-9 months of the year. Even in winter (January-March) the temperature is still around 17 to 18 degrees so with a wetsuit, it's still possible. Only problem then is that many watersports companies generally only operate between April and October, so you may need to look a little harder for someone to teach you. Cyprus has the famous Zenobia wreck off the coast of Larnaca which sank in 1980 carrying 104 articulated lorries. A "must do" for any keen diver staying Cyprus. But wherever you are staying, you can enjoy diving in the clear blue waters with excellent visibility most of the time. Check out my diving page for more details. 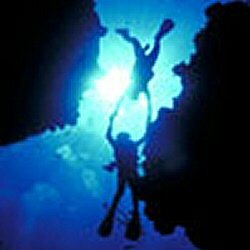 Or order some FREE scuba diving brochures to find a reputable dive company in Cyprus. If you are lucky enough to live here with friends who waterski or dive then you can get out on the water throughout the summer months. It's a great way to avoid the heat of summer! So have fun on the water next time you're in Cyprus and do something different - try some Cyprus watersports! Ski Cyprus - in the snow!